I had to log in just to show my love for this photo. Completely gorgeous ♡♡♡. Can't believe worlds are already here, STOP GOING TOO FAST TIME!!!!!! 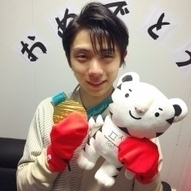 Happy first pyeongchang gold anniversary YUZUUUUUUUUUUUUUU!!!!!!!!! It's a day we all will never forget. I still can feel the cold sweat walking around my tv doing weird noises every time Yuzuru jumped LOL . Wow. Pyeongchang was really one year ago. Incredible how fast time goes. I remember thinking back in those days "It's been only one week since yuzu won again" and so on. But now it's almost a year, and then two years will pass and so on. I'm just grateful I've been able to follow his journey for another year. Things have changed a lot since I discovered him in 2014 and he was starting his legacy. I wonder what the future holds for this boy. I really hope it's full of happy things T-T. I hope he is able to recover for worlds, I hope it's a competition filled with good memories. I just hope he is healthy tbh don't push yourself too much Yuzuru!!!! I'm going to be a mess at worlds. OMG I just saw that photo!!!!!!!!!!!!!!!!! You see that smile????? he looks so happy, I'm going to cry , I'm soo glad to see them together. Expected news but still sad ones. I can't even imagine how frustrating this must be for him. And to be honest I just feel really bad, I wonder, how much will his body keep tolerating? Even with all his amazing talent I just can't imagine what if he can't skate more. I was very excited when he said he still had things to do in skating (well more like landing 4A) but I fear for his health. I fear he might be asking too much of his body. But I know he enjoys performing at his best the most (which means crazy difficulty). I don't know what the future holds but I hope Yuzu is able to achieve his goals and retire when he feels ready and not because his body just doesn't hold anymore. Just read the news. It was the most expected. I know he must be dissappointed. But I feel calm. I know this is for the best. I really hope he has a nice recovery. I hope he really doesn't go to GPF and nationals. He hasn't taken any season off, It's sad that he won't be at those events but he really needs this rest I think. Even if it may be frustrating. His body won't hold forever if he keeps pushing it. I understand and respect his decision to skate the free program so now he can take his time to heal his body. Than you for writting this beautiful post. To be honest I woke up to these news and just felt really bad. But posts like this calm me and give me a bit of hope. Super happy for Brezina!!! He is going to GPF!!!! !